Health Services and Counseling Services are partnering to provide an informative session on how to change the conversation about addiction. Earn Wellness Seminar and 300 points! 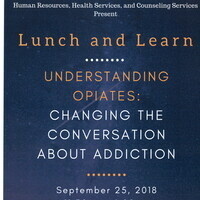 I really enjoyed the presentation and learned a number of things not only about opiates but about addiction in general.